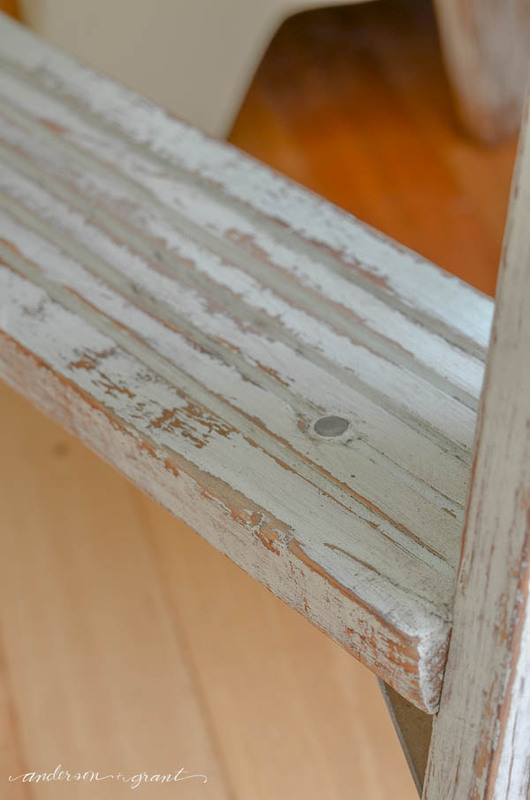 To achieve this finish, I used four different "techniques," although I hate to call them that because each step was so simple. They really all worked together to give an extremely distressed look, though. For this project, I decided to stop out of my box a bit and chose to use a light mint color for my paint. Pastels are normally not my thing. But when I stated my fear over the use of the color on Instagram, everyone assured me that mint is a great color and to go for it. 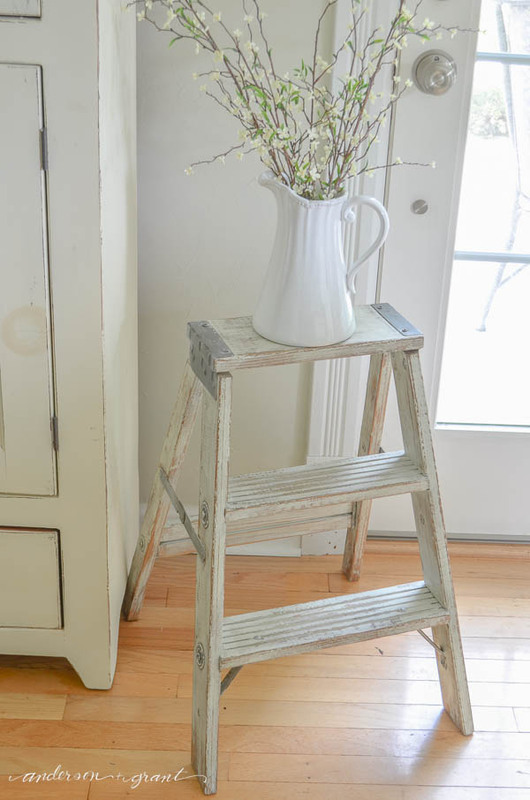 Oddly enough, by the time the ladder was done, the mint really doesn't look so mint-y after all. It almost looks like a light gray. But I'm so pleased with how it turned out whatever color it looks like. My favorite parts are all the metal hinges and bolts. I didn't worry about trying to keep them free from paint since it was supposed to look a little sloppy, which made the job easier. 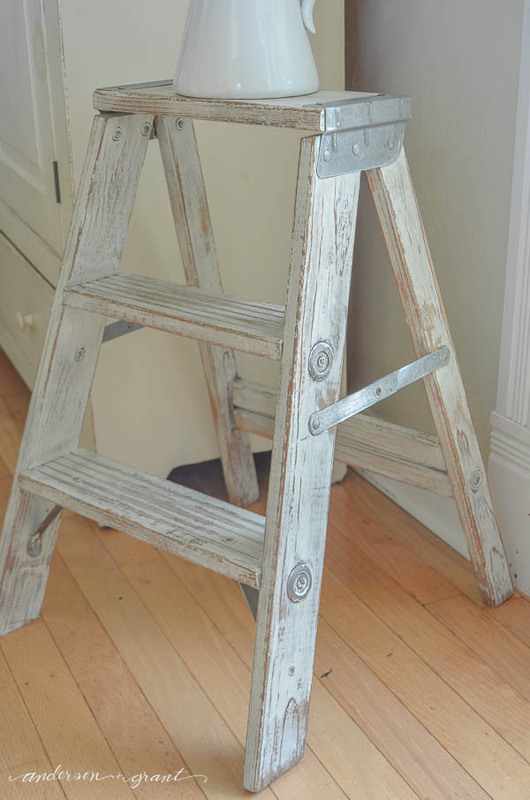 Then they got sanded with the rest of the ladder to once again reveal most of the patina on the metal. 1. 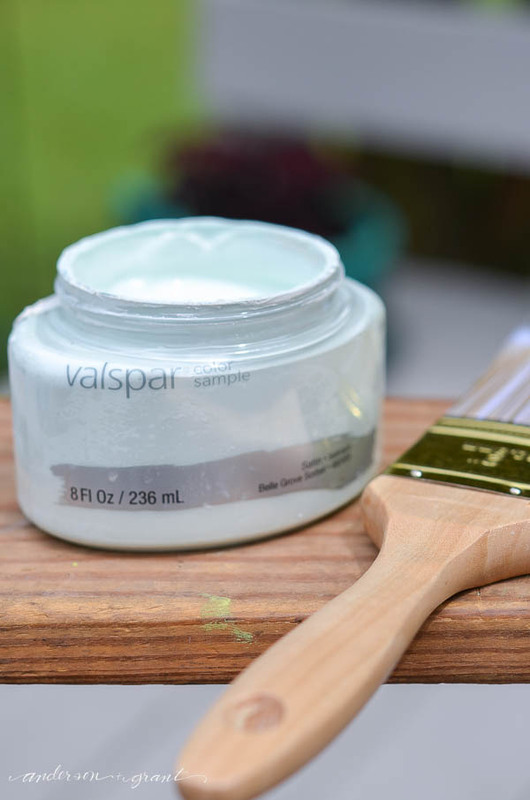 Start by rubbing clear candle wax or a wax puck* over areas that you want the paint to chip away easily. 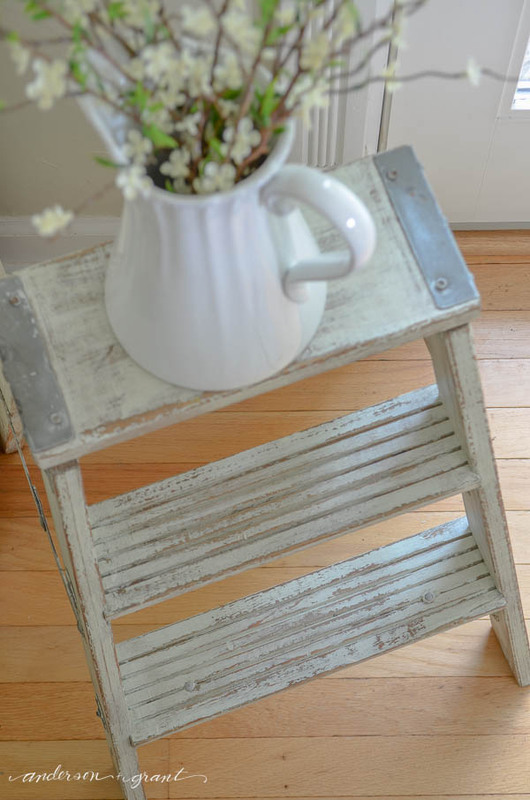 Focus on areas like the edges of your furniture or bottoms of the feet where paint would naturally be worn away on an old piece. I also like to add some wax in sections were there in a gouge in the wood or where the grain is raised. The wax creates a resist and protects the surface underneath from being sanded away, while not allowing the paint you add on top to stick. It is a trick I use on practically everything I paint. 2. Apply your paint in a really sloppy way. 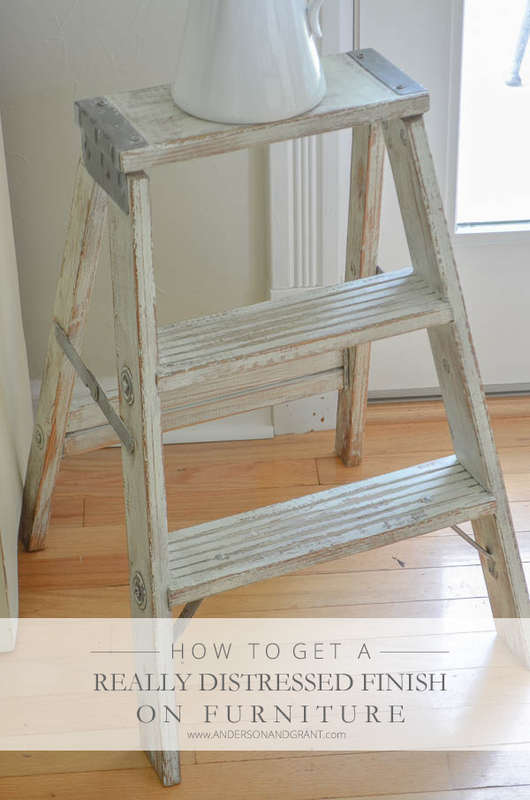 Don't worry about painting each and every spot on the piece of furniture. 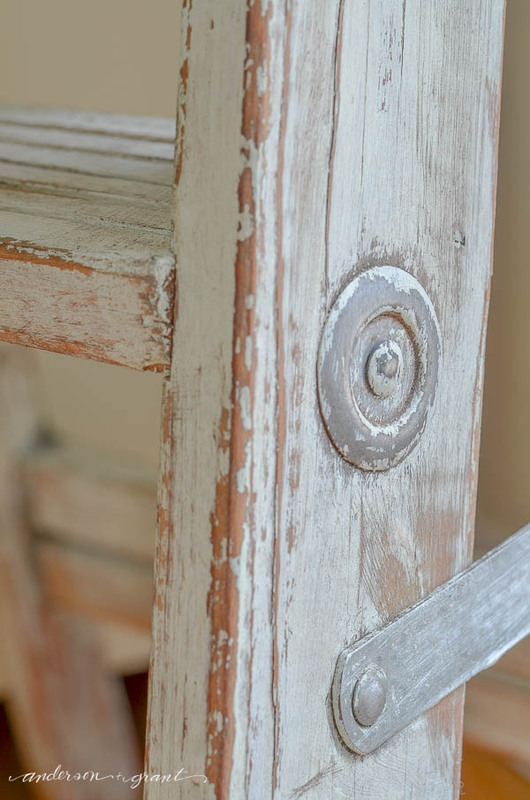 Places that are left bare will look like areas where the paint has totally worn away when you're done. 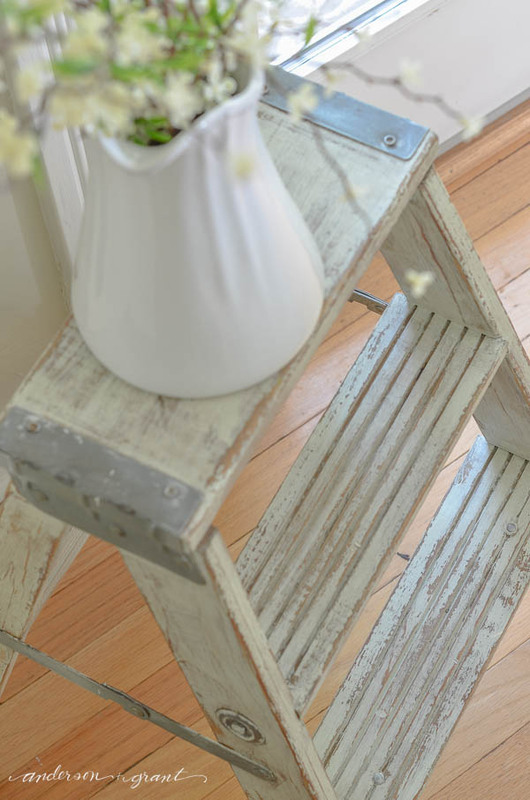 Do be sure to paint places that wouldn't naturally distress so that it doesn't end up looking like you skipped that spot! 3. Apply one coat of paint over the entire piece. But when that coat is dry, go back in small random places and add a second coat. 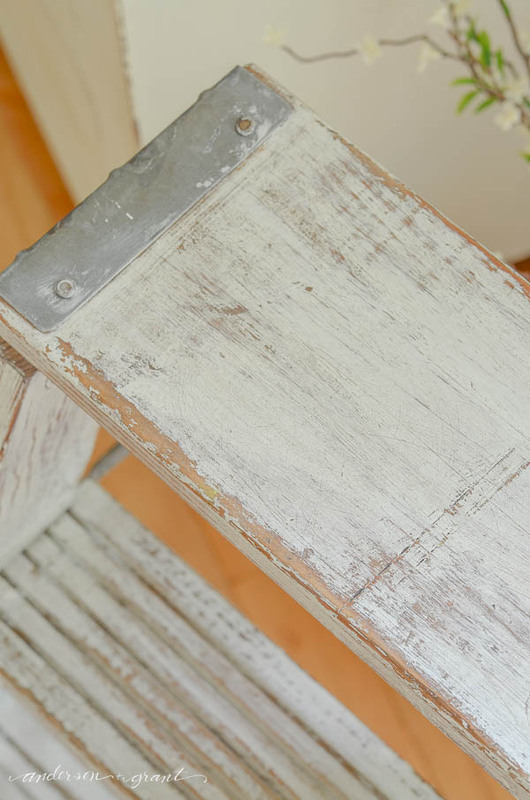 When everything is being sanded, those areas will distress less, making the finish look more worn in some places than others. 4. 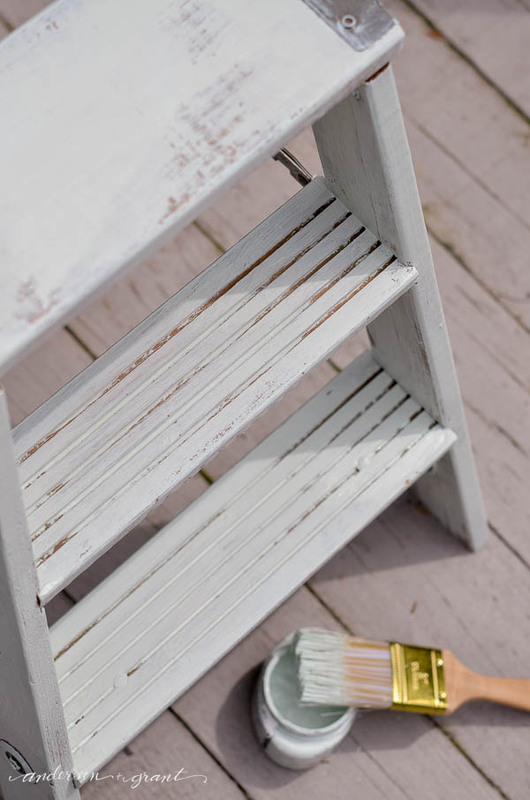 When both coats of paint are dry, go over the entire piece with a heavy 80 grit sandpaper*. It has a lot of texture to it and will sand away paint easily. Sand over every area to blend in what you've done to make it all look natural. 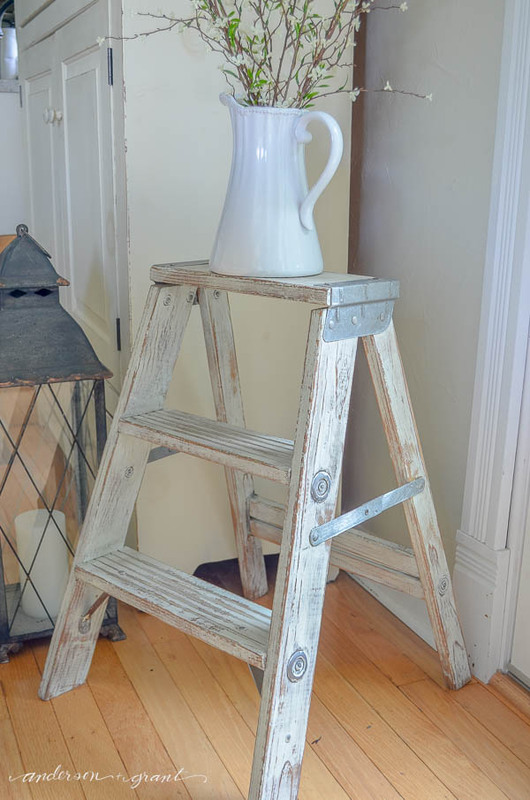 When my ladder was done being painted, I went over the entire thing with Miss Mustard Seed's antiquing wax (affiliate link) to further age the ladder and give it just a little patina. It really settles into the cracks and nicks in the wood to make it look old. 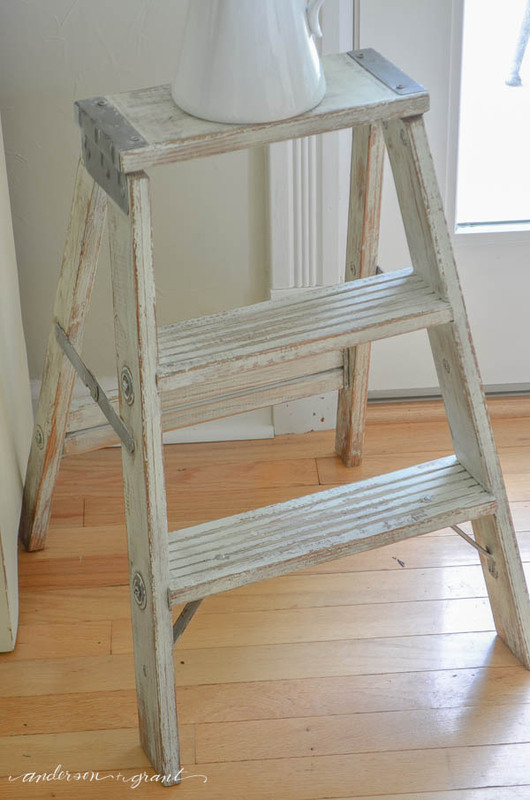 So that is my completed ladder. 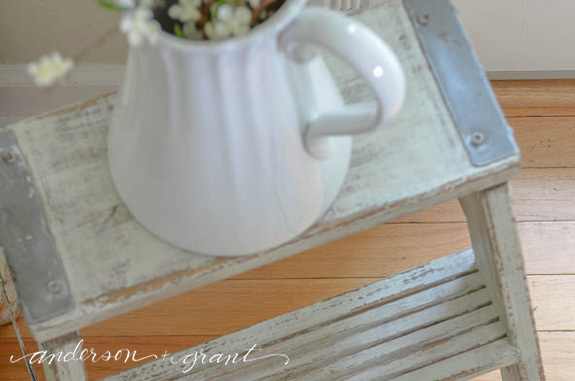 Are you into the really distressed look for painted furniture like I am? I'd love for you to let me know what you think in the comments below, visit me on Facebook, or chat with me on Instagram. 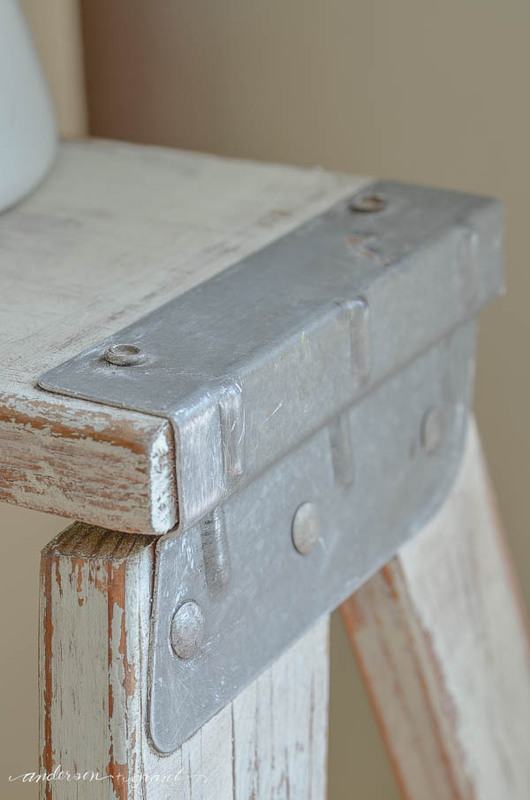 Need some more inspiration for painting furniture? Check out these great posts!